When you look at this picture, what do you see? A happy girl, who happens to be wearing braces, sitting in her car on a nice day. Am I right? Well, that’s only part of the story. I took this selfie on an ordinary day in the park where I often spend my lunch breaks while working as a supported housing specialist. I typically grab something to eat through the drive-thru at Burger King, my usual spot. Then I park my car in the park a few blocks away from my office. Most of the time, I take a nice walk after chowing down. Now you’re probably thinking, “So what? She likes to eat lunch and walk in the park. What am I missing?” Well, let’s get to the most exciting part of the story and my primary reason for writing this. In this particular picture, you are correct in that you see a happy girl with braces. What you don’t see just by looking at it is that she’s a happy Aspie! I took this picture only months after I was diagnosed with Asperger’s syndrome. I’m most likely beaming with happiness because I was elated to finally have answers and to have my suspicions of five years confirmed. It meant a lot to me to finally make what I saw as part of my identity official. Now, look a little more closely. If you notice, I’m wearing a necklace with multicolored puzzle pieces in the pendant. 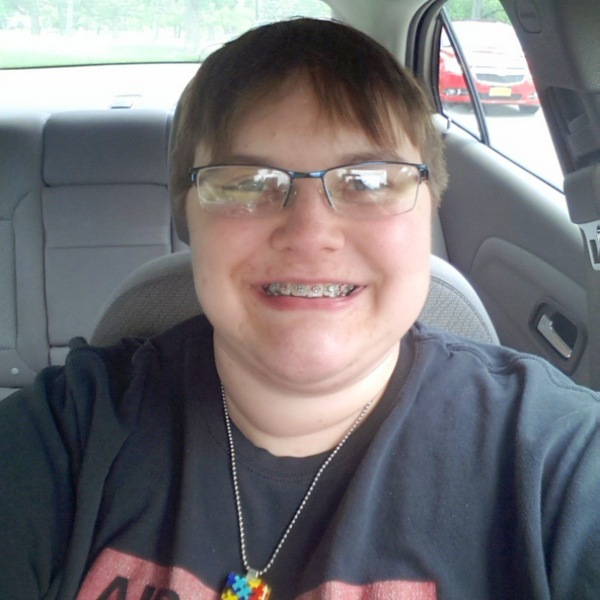 I got this necklace for myself as my way of spreading autism awareness and acceptance. Another neat factoid about this picture? It has been featured in a calendar that autistic adults submitted their pictures to for each month. I thought it captured the essence of my being: a happy girl with an expression of youthful joy, flashing her tin grin without any reservations. I’m simply me. I was excited to see the finished product and to tell my family about it. Some of them ordered a copy. So what did getting this diagnosis mean for me? It meant that after years of knowing I was a little different, I finally had a reason for it. I could put a name to the challenges I faced, and more importantly, the gifts life has handed me. I’ve always been that girl who was thought of as a little weird for not wanting to date or dress like the others. My differences are always something I’ve carried with pride. Fitting in is a moot point for me. I’m much happier playing my video games, geeking out over the latest Android update and living life on my own terms. This is one of the Aspie traits I embrace to the fullest. They say a picture says a thousand words. I think that statement just about sums it up.